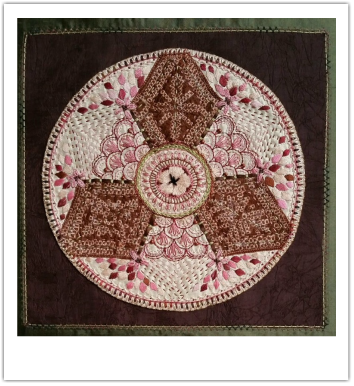 This mandala is all silk fabric, hand embroidered with primarily silk threads. The design details are inspired by traditional Japanese imagery. The brown silk appliques are dyed using the shibori technique. The colors are chosen to reflect the cherry blossom tree colors. The finished piece is wrapped around a canvas frame. Inspired by the paintings of Angelo Franco. He uses his thumb as a tool to create layers of colored circles to develop depth, shadows, images and movement. 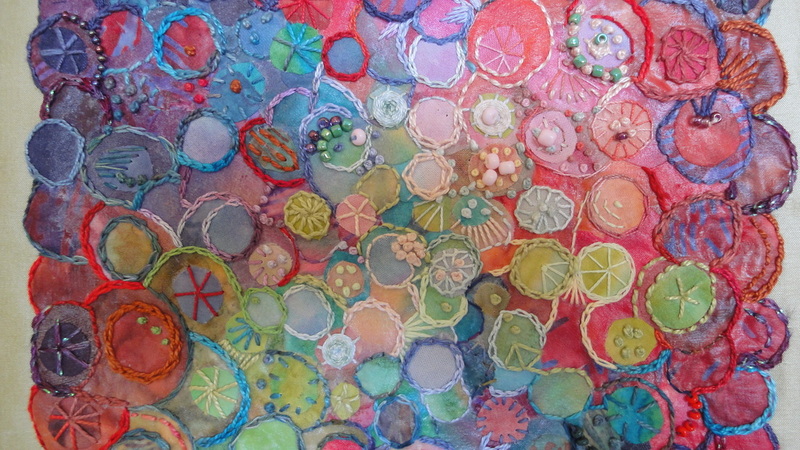 Here I have layered circles of fabric on a cotton muslin backing and then applied a thin matte acrylic medium to fuse the layers. When dried the piece is very flexible and I was able to bead and embroider by hand. 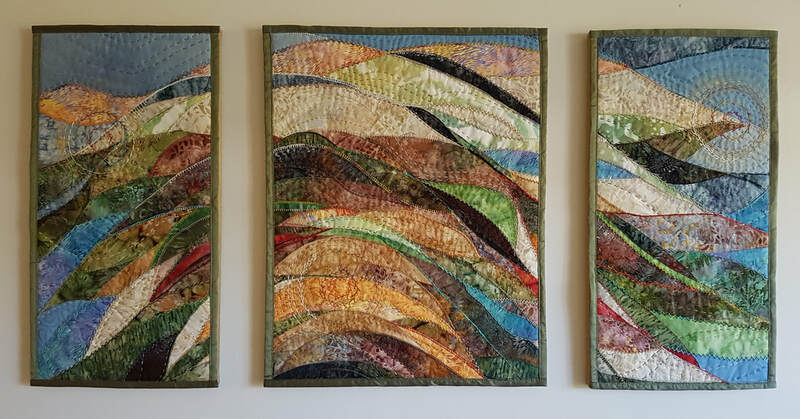 The finished piece is mounted on silk, machine embroidered to highlight the edges and then wrapped around a framed canvas. Hand painted and dyed silk fabric as background. Petals are hand painted cotton. 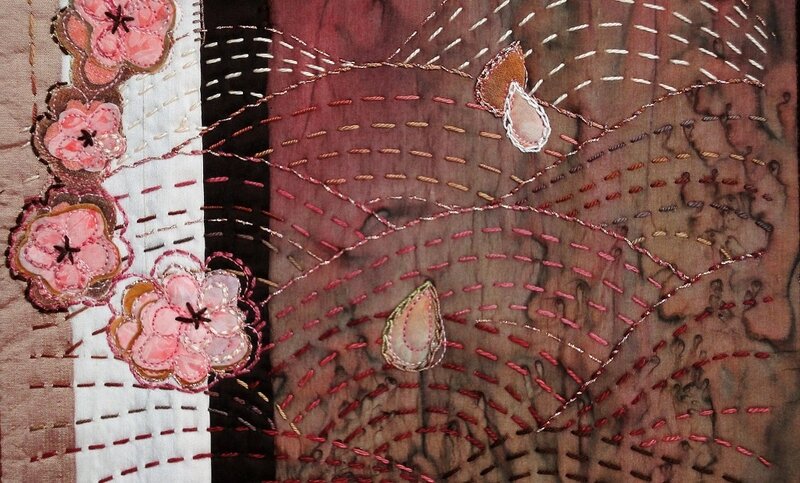 Hand embroidered running stitches and some free motion machine stitching to attach blossoms. The hand stitching was inspired by traditional Japanese sashiko stitches. I added a few beads to highlight the moonlight. Embroidery threads are silk, cotton and rayon, many hand dyed. This piece was my seventh entry into Vancouver's Cherry Blossom Festival exhibit at the Silk Purse. ​Commercial batik cottons were fused to a cotton backing then hand and machined quilted to a silk batting. The three silk bound images are wrapped around stretched canvases and wired for hanging. ​The theme for this piece was Fused Grid. My inspiration came from the copper batik block wall in the Mingei Museum in San Diego. I transferred a portion of a photograph I had taken of the wall onto a piece of copper colored silk. This became the background for this collage. 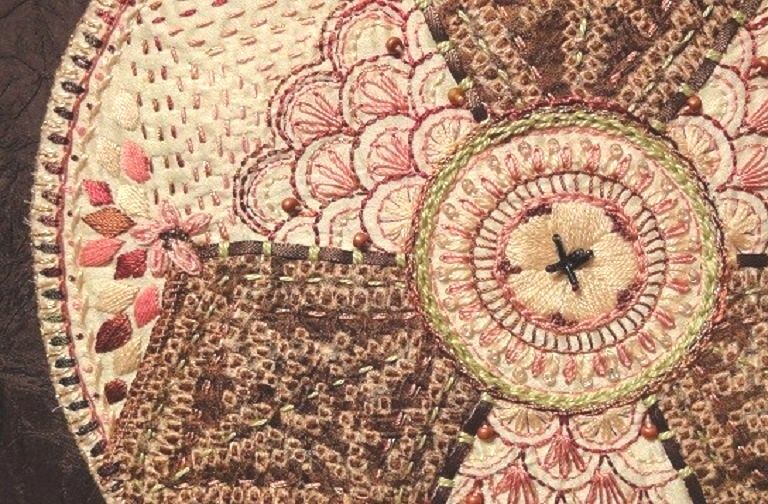 Since Mingei means the art of the people, I used materials and techniques to illustrate a variety of traditional artisan crafts, such as shibori, beading, embroidery, lace-making, mud-resist and quilting. The fabrics are silk, cotton and linen. I used natural indigo to create the blue color. My design includes some resist fabric made by others and trims, beads and threads from my stash. All stitching is mine.